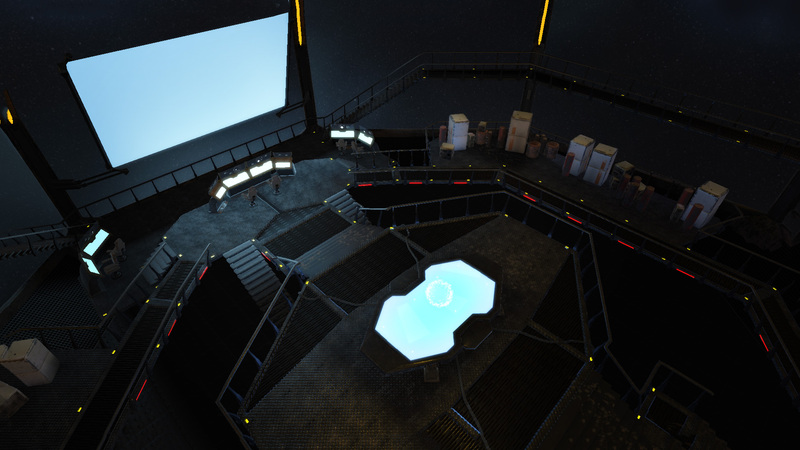 Space Rift was my first adventure in ‘serious’ VR gaming. I’d played some more casual games, but I was more than excited to take my seat in the cockpit of a spaceship and blast off amongst the stars. You can imagine my disappointment when I’m cast as a miner in Space Rift: Episode 1, then. In a future where a meteor shower left Earth as a uninhabitable graveyard, humanity took to the stars and set up shop on that most illustrious of sci-fi locations; Mars. It’s an Orwellian future where mega-corporations control every aspect of daily life, including how much oxygen their workers get on a daily basis. After a brief introduction, we meet Casey Black, a talented pilot struggling to make ends meet under the yoke of the Weyss and Pandora corporations. You and Casey take on a job as a miner, darting through space in your beloved ship and sending out probes to scope out asteroids for precious minerals. It’s the least interesting part of Mass Effect 2, but developers Vibrant Core have actually done a good job to make it not totally tedious. Of course, that wouldn’t make much of a video game, and the action kicks off early in the first chapter. After a brief misunderstanding with your ships corporation-run computer, you get accused of treason and have to resort to desertion to save your own life. 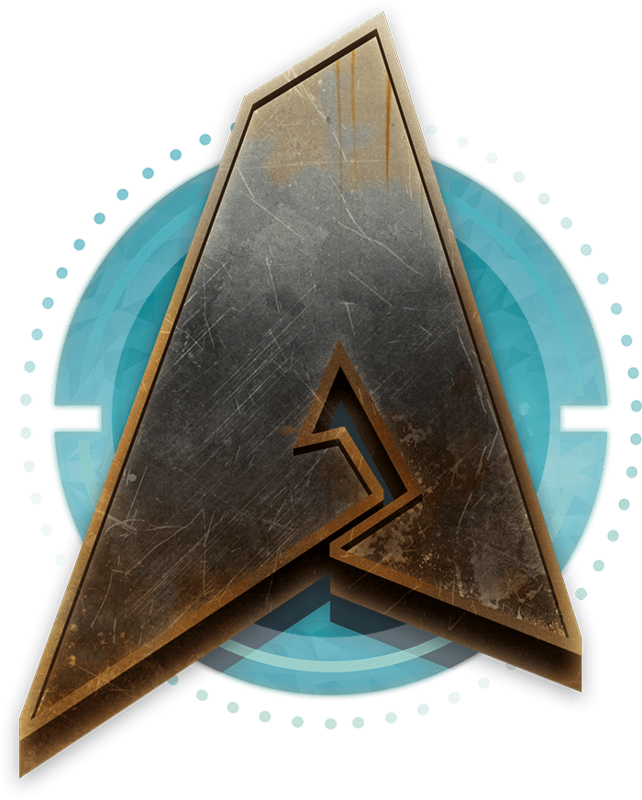 The first chapter serves as an excellent tutorial, with the onboard computer teaching you about all the different screens on your ship, as well as taking you through the basics of flying, mining and combat. Like I said, this was my first intense experience with virtual reality. Partially due to that, I experienced some intense motion sickness the first few times I played Space Rift. It wasn’t an issue after the first 40 minutes or so, but I spread the first two chapters out over two days so as to avoid getting too sick. 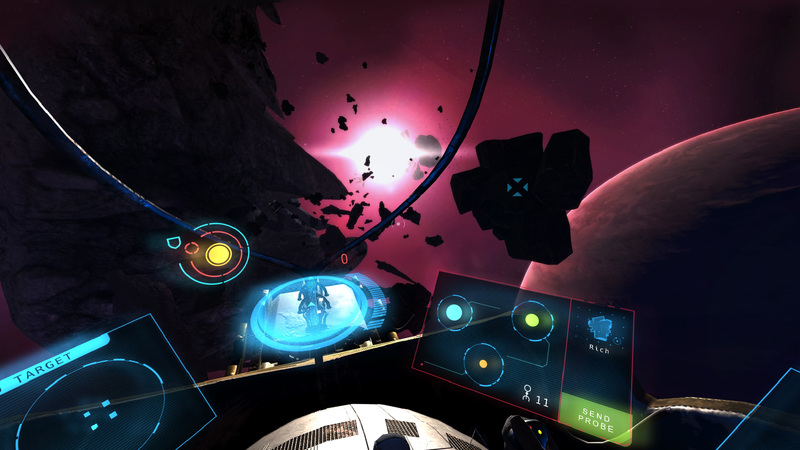 I’m not sure that it’s an issue with Space Rift in particular, but VR as a medium, especially considering the content of the game. I have to say, motion sickness aside, zipping between asteroids, ducking and diving to outmanoeuvre enemy drones and whipping your head around to shoot them down, Space Rift is a blast. When I was pushing Casey and his ship to find out my limits in terms of piloting and nausea, I often had a huge grin on my face. At first, moving your head around to aim the weapons you put on your ship, more on that in a second, is pretty awkward. Your aiming rectitude is always directly in front of you, so if you want to aim your gun you need to look around. It’s only unusual at first, and after a while becomes pretty second nature. A major issue I had was not with the gunplay, but with drilling certain asteroids. When you get close enough to drill the minerals within and hit the button, the game takes control of your ships, often spinning it around and reversing it into the asteroid. The first few times, this caused my stomach to seriously churn. After you meet up with the crew who take you in once you have deserted the corporations, you get to upgrade Casey’s ship using the credits you get by mining. 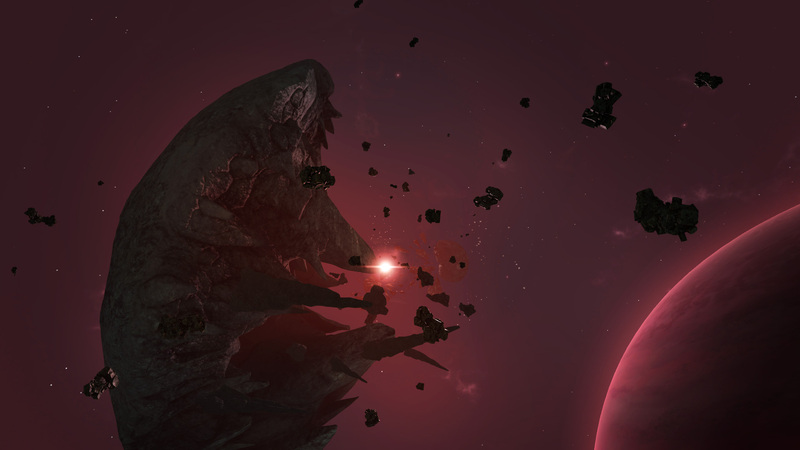 It should be noted that, from the second mission onwards, mining becomes less and less important, but always there as a means to earn credits. And there’s plenty to spend your hard-earned money on. You can upgrade the shields, weapons, cargo and engines on your ship. I particularly enjoyed the minigun you unlock later in the game. There’s only minor issues with immersion from me. 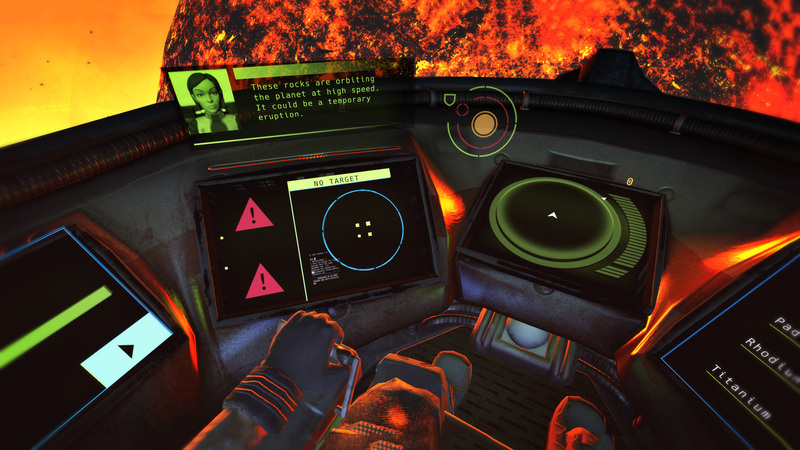 Using an Xbox controller for this sort of game is fine, but Space Rift renders Casey’s entire body in the cockpit if you look down, including his hands on the controls of the ship. It’s not a Touch-enabled game, so seeing Casey’s hands doing something different from my own made me remember that I was playing a game. More importantly, during a fairly tense scene in the game’s final chapter, I piloted the ship straight through the wall of…well, that’s a spoiler. But I flew right through a wall, and was able to fly over to the next section and fly back through the wall. I never went back to try to replicate the feat, and lots of games have issues like this one, but it was a shame that I was forced out of the immersion of the moment because of a graphical glitch. 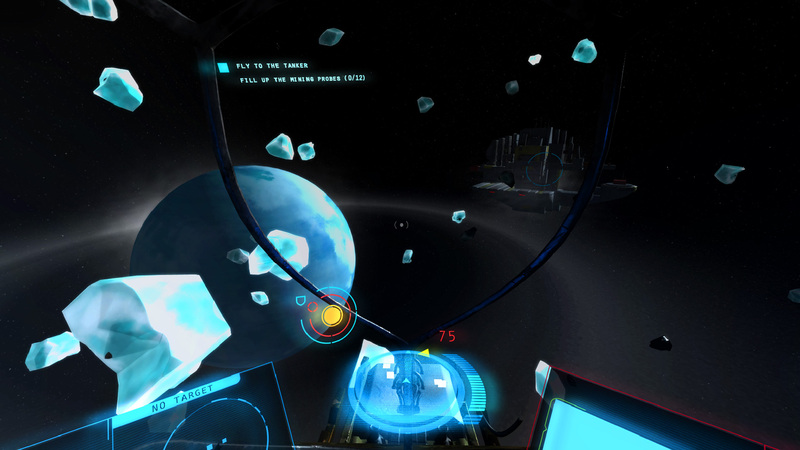 Space Rift is a great entry-level Space piloting game for VR. If you’ve already got a tolerance to the general nausea of VR games, it’s a great way to spend a few hours. But that’s all you’ll get out of it. My total playtime for the five-chapter Episode One came in at around 2 hours, and I did some extensive mining during every mission. Being an episodic game, I’m sure there’s more content to come, but for now, you’re not getting a lot of gameplay for your money.